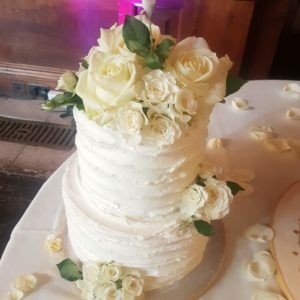 Below are some of our wedding cakes perfect for brides and grooms who are looking for a more affordable yet sophisticated design. 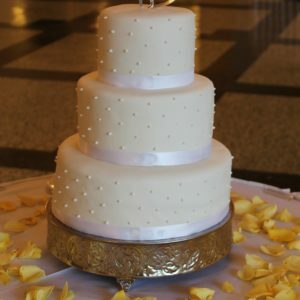 We take pride in providing the same excellent service and quality on all our cakes. Please be advised, these cakes will be carefully stacked and packaged for collection only from our premises in IG3. All these cakes are priced between £170 – £260. All the flowers and decorations on the cake are included in the price. Cake toppers are usually provided by the clients and hence not included in the price. Fresh flowers will be supplied separately to retain their freshness and easy transport unless advised otherwise. Colours for fresh flowers are customisbale. However, there will be an extra charge for that. Delicious layers of sponge covered in velvetty dreamy white buttercream style frosting finished off with seasonal flowers. Colours (will incur a charge), sizes and flavours are fully customisable. A beautiful wedding cake with hand piped dots finished off with seasonal flowers and a string of pearls. Colours, sizes and flavours are fully customisable. 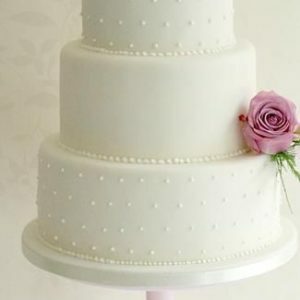 An elegant wedding cake decorated with hand piped royal icing pearls. (Does not include the topper). Colour, flavours and sizes are fully customisable. 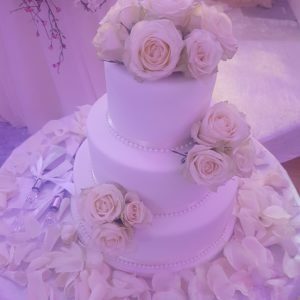 White wedding cake adorned with hand crafted sugar flowers. Colours, flavours and sizes are fully customisable. 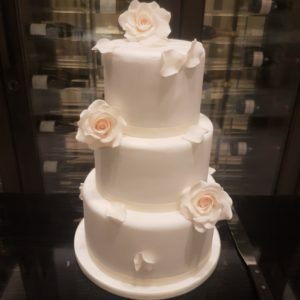 An elegant wedding cake decorated with ivory fresh seasonal flowers handpicked by our florist. This is a perfect finishing touch for any wedding. Flower colours (will incur a charge), ribbons and flavours are fully customisable. © Bespoke Cakes & Treats. All Rights Reserved.